Our customers love NEST fragrant candles made with a premium, soft, highly refined, and of the highest grade wax combined with the finest fragrance oils to optimize burn and fragrance diffusion. Each pillow hand-stuffed with All-European white goose down and covered with worldclass downproof fabrics. DEWOOLFSON pillows are sure to inspire sweet dreams. Each pair of DEWOOLFSON silk cases are packaged in their own silk bag and are made from the finest silk we've found. DEWOOLFSON comforters, pillows, and featherbeds are individually filled and sewn from the finest TM materials and shipped from our North Carolina factory. Filled with your choice of hand-select European white goose down and covered with some of the world's finest German downproof fabrics. towels & tabletop Embroidered linen guest towels by ANALI are created with joy and personality in mind. SFERRA's frolicing table linens are celebration ready! Choose from some of the most luxurious throws found anywhere . . . from Scotland, France, Italy, Peru or Switzerland, in wool, cotton or cashmere. From $132 to $750. We have something warm for everyone on your list! One-of-a-kind FlashPoint candles are distinguished by their large tunnel kiln, handglazed ceramic vessels, hand-poured with natural 100% dye-free wax. See our selection! Choose from 6-wick Saxon to 23-wick Beauregard. Indoor and outdoor use. in style! Set the tone of your holiday celebration with festive jacquard woven table and kitchen linens by Le Jacquard Francais. Mix and match with crisp linen cloths by SFERRA, bordered by a seasonal hue. Don't forget to spread the cheer into your guest bath with striking embroidered linen guest towels by Anali. GiftCard Our Gift Card – the perfect gift for that oh− so−dear, yet hard−to−buy−for person in your life. You decide the amount and we will email them the wonderful news inside a lovely card. Simple and sincere. Registry Create your Gift Registry at dewoolfsonlinens.com – the perfect and easy way to create a wish list for yourself or someone else when those special occasions arise. 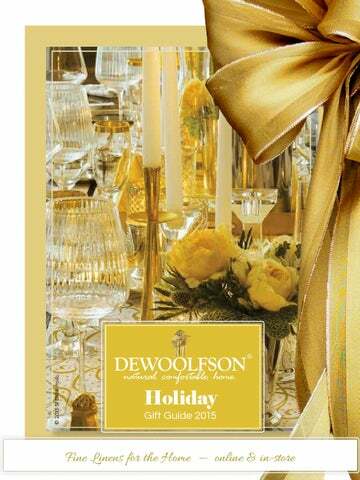 DEWOOLFSON LINENS 9452 NC Highway 105 Banner Elk, NC 28604 U.S.A.
© 2015 DEWOOLFSON DOWN INT’L., INC.